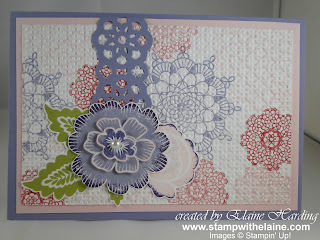 I love using the square lattice embossing folder to add texture to the background. I first stamped the images from Delicate Doilies which you can find on page 69 of the new catalogue, (122590 in wood mount @ £20.95 and in clear mount - 122592 @ 16.95 and consists of 4 rubber stamp images). I then popped my stamped images in the embossing folder and ran it through the Big Shot. The card base is Wisteria Wonder. This is one of the new "In Colors" and is gorgeous in real life. It coordinates beautifully with Pink Pirouette and another In Colour featured here is Lucky Limeade for the stamped leaves. We also have a new bigger size punch called Ribbon Lace Border and I've punched a Lace Border to overlay on top of the dry embossed Delicate Doiley images in lieu of using ribbon. I used the rock n roll technique on the main flowers from "Array of Sunshine", which is a Hostess set you can purchase with your Hostess Pounds at a specially reduced Hostess price. These specially priced sets are exclusive to Hostesses only, so if you want to qualify, you'll need to book a workshop. I stamped the flower 3 times without re-inking the stamp to get a "graduated" look as I wanted a softer looking centre. I added a faux pearl to the centre last, adhering each layer with dimensionals. A little late posting today, I guess better late than never! I hope you're having a restful Sunday.